The trains and subways in Hong Kong and Shanghai all have cheerful warnings to please mind the gap or watch the gap when you are boarding the train car. 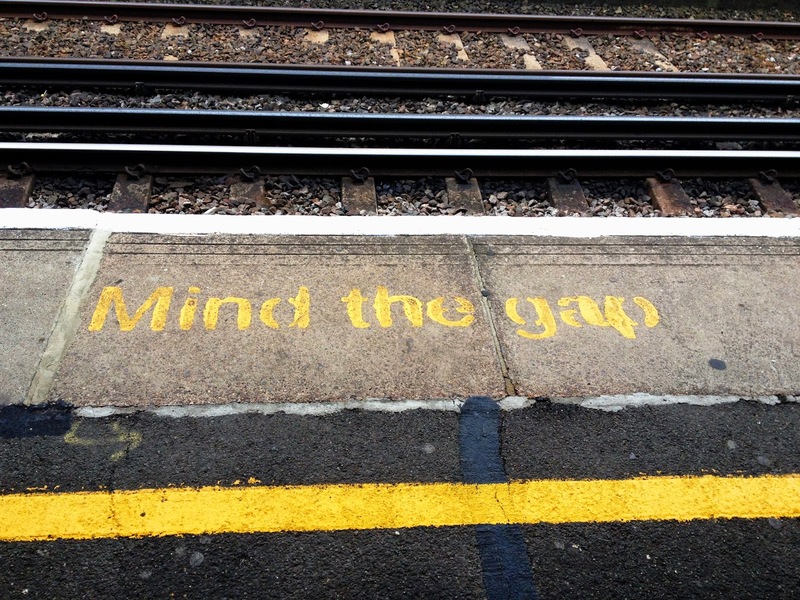 However, the gap they warn you against is no more than five inches, and level with the platform, so unless you trip, the gap isn't going to cause you much damage or hardship. I've always chuckled to myself over the somewhat unnecessary warnings. And then we went to London, where the saying has been in use for a hundred years by the train conductors, and printed and used in automated announcements since 1969 (to save the conductors from having to repeat it over and over again the story goes). 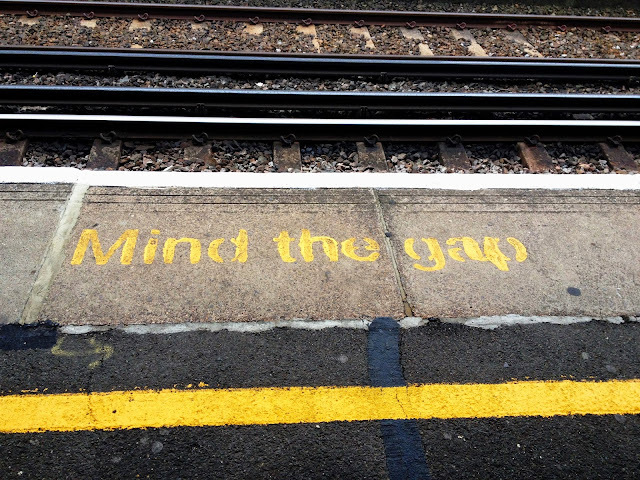 In London, the gap between the platform and the train car is sometimes so wide, and so different in height, a full grown man could seriously fall between if he wasn't paying attention. A few of the Underground (Tube) stations were curved, with curved platforms. And while the tracks curved as well, each individual car is obviously straight, meaning the gap was wider at one end of the door than the other. So some gaps were even trickier to manage than others. There were a few times we helped someone on or off with a baby stroller, which would have been difficult for just one person to manage. It made me think that perhaps mind the gap was an understatement. PAY ATTENTION WHEN BOARDING THE TRAIN SO YOU DON'T TWIST AN ANKLE OR DIE seemed a bit more appropriate. 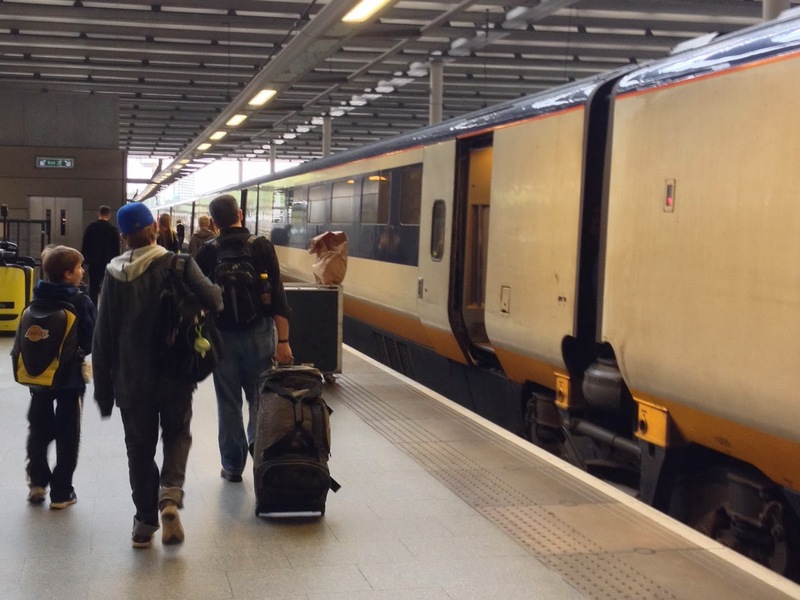 I don't have a single photo of any Underground station gaps to show you (we rarely had to wait for a train, it always seemed to be there waiting, so no photos because I was busy minding the gap and saving my ankles), but here is a photo of the family walking alongside the Eurostar train we took from London to Paris, which just happens to have an open door next to the platform. No handy step to get you halfway there in Europe! It's a giant leap from platform to train car. And a pain if you've got a big, heavy, rolling suitcase which actually has to be lifted up. Thank you, Michael, for being our designated lifter. The trains and Metro in Paris also had entrances which were not level to the platforms by a few inches, but London takes the cake. Considering England's very first underground rail line dates back 150 years, it's not surprising there are much larger and irregular spaces than here in Shanghai, where the Metro first opened in 1993, a mere 20 years ago. That's quite a gap in railway line technology advancement. Now when riding the Metro here I still chuckle at the watch the gap signs and announcements, but for a whole different reason. Now I picture the scene in Crocodile Dundee where he's in New York city, being mugged by a guy with a little switchblade. Laughing, he pulls out his giant Aussie blade and says, "You call that a knife?" In my head, I'm now saying, "You call that a gap?" in my best Australian accent. For I have seen a gap, and I did mind it.